The start of Jon Pertwee’s final year in the titular role sees a return to Earth’s past, time travel not really a focus of the era and trips in the TARDIS instead preferring the future and alien worlds. The result, in a way, channels the William Hartnell pseudo-historical story ‘The Time Meddler’ while simultaneously feeling like a transition story that showcases the type of format and storytelling that would become so popular in the upcoming Tom Baker era. Even as the characters in the past switch between nuanced and overt caricatures, the script and, indeed, the Doctor never seem to take any of them seriously as a threat. In fairness, even the Sontaran Linx isn’t necessarily presented as a more credible threat by himself, but the technology and resources at his disposal certainly heighten his menace to a respectable level. Linx and Irongron on both sides are not presented as the most intelligent, undoubtedly an attack on endlessly-warring people, but Linx’s boasting of his military prowess as more important than anything else firmly solidifies the characterization of the Sontarans as a whole. Even the manner in which Linx spins the Sontarans’ probic vent weakness as being a strength because it means that they must always face their foes head-on is distinctly bold-headed and full of grandeur. The Sontaran tactic of just overwhelming foes with numbers regardless of the cost and Linx admitting that retreat sometimes is necessary hardly portrays the aliens as the most formidable race no matter how effective they may be. Elisabeth Sladen’s feminist Sarah Jane Smith is initially greeted with the Third Doctor’s trademark tetchiness and dismissiveness, a technique he seems to employ to get the mark of new people, though the story in general does go a bit out of its way to make her feminist views the source of jokes. ‘The Time Warrior’ is a rough welcome for the character, but Sladen exudes a remarkable composure and charisma from the start that already hints at the greatness to come. With the Third Doctor arguably at his most conservative as he attempts to maintain the status quo, in essence fulfilling the very mantra of the Time Lords while distancing himself from the more profound measures his previous incarnations had taken, Pertwee himself is at his absolute best in this tale as he brings out contrasting good nature and patronising pomposity equally well. 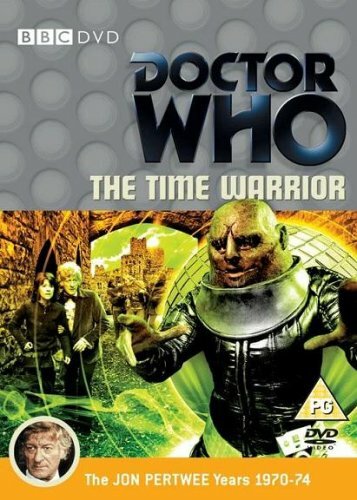 The settings used are incredibly well-realized given the budget and still hold up quite well to today’s standards, and the Sontarans instantly make their mark as one of the more unique races in Doctor Who, causing ‘The Time Warrior’ to be a unique look to the past that also looks to the future to present a very engaging and enjoyable tale.